That’s a very helpful comment from, Alyssa Boike, a recent workshop participant. Textbooks don’t have that same luxury. You can always add those elements into the problem – the questions, the information, the mathematical structures, the strategy – as your students struggle and need help. But you can’t subtract them. Once your students see the table, you can’t ask, “What tool could we use to organize ourselves?” The answer has been given. Once they see the table headings, you can’t ask, “What quantities seem important to keep track of in the table?” They know now. Once you add the strategy (“Look at smaller versions.”) their answers to the question “What strategies could we use?” won’t be as interesting. In sum, much of the problem has been pre-formulated, which is a pity, seeing as how mathematicians and cognitive psychologists and education researchers agree that formulating the problem leads to success and interest in solving the problem. So again I have to remind myself to be less helpful and be more thoughtful instead. I don’t know that I have anything terribly insightful to add, but this seems like a fun conversation. I have this cube (show picture/tangible) made up of smaller cubes. If I dipped the whole thing in paint, how many of the smaller cubes would have paint on them? Is there a rule or shortcut we can create that would allow us to answer that question for ANY sized cube? To me, the issue seems to be that the version we see in your blog post attempts to steer the direction of student thinking and leaves little room for play and divergent thinking/approaches. It “scaffolds” away all of the rich mathematical thinking and play in an attempt to cover standards. In particular, the unspoken assumption in the way it has been printed is that writing and graphing linear, quadratic, and exponential functions is the real “Math” in the task (things we can easily point to as belonging to the discipline/standards). But, at it’s core and without all the mechanical scaffolding (as re-posed here), the question allows room for many mathematical strengths and habits of mind to be valued and sends different messages about what the real “math” might be: taking things apart and putting them back together, creating systems of organization, assigning variables, making generalizations, posing extension questions, etc. In addition, because it doesn’t dictate how to proceed, it encourages students to trust their own thinking and allows them to “see themselves” in the work that develops. The work of the teacher becomes to follow the student, looking for mathematically ripe opportunities in their work and thinking. 2014 Jun 2. Christopher Danielson brings his perspective to the task as writer of CMP. 2015 Nov 2. Great example from Jennifer Michaelis. I largely agree with your point. So, why did this textbook make the decision to add all of this supporting text? Maybe it has to do with the limitations of paper or because there are substantial pedagogical differences between you(/me) and the authors of this text. Something different also makes sense to me, though I have no idea if it’s true. I imagine that CMP wrote the problem this way because most teachers don’t agree with the “you can always add” ethos. This text is attempting to become widely used by teachers who won’t know how to do the things that you’re describing. So a textbook maker has to make some tough decisions: how do you make a great problem accessible to kids with a teacher who may not know how to take a great problem and make it accessible? That’s what I imagine. I’m sure that Dan and lots and lots of other folks can simply tell me whether that’s right or wrong. Dan, your suggestion has been that with better curricular materials, particularly with digital materials, we can give this same sequence of support but lapsed in time. There’s still a trade-off here, since good teachers will make these questions feel organic and tailor them to the specific things they’re seeing in class, but it’s a better trade-off. A separate question is, what’s the best way to teach teachers how to support problem solving in class? Related: how do curricular materials impact the practice of teachers when we’re not using the curricular materials? Would your digital curricular materials impact the learning of a teacher? We should include those scaffolds because lots of teachers need them. But the print medium affects those scaffolds in non-trivial ways, compressing them into the same visual space most importantly. Print is a huge part of the problem here. There’s still a trade-off here, since good teachers will make these questions feel organic and tailor them to the specific things they’re seeing in class, but it’s a better trade-off. I don’t understand the trade-off here. Teachers who possess what I’ll normatively call “great pedagogy” will skip the scaffolds anyway. Related: how do curricular materials impact the practice of teachers when we’re not using the curricular materials? Would your digital curricular materials impact the learning of a teacher? That being said, if we’re going with the “how many faces of each cube are painted?” model, then that image is really the solution to the problem, and so belongs in Act 3. Then I guess I’m confused about the criticism of textbooks in this post. Something like your Penny Circle includes the same sorts of scaffolding that you highlight here: a central question, a strategy, a table, a graph, table headings. I like the way you decompress these in time, but that’s different than giving kids a chance to add these elements, which is what you seem to be advocating for here. One distinction that might help is the one between classroom and curriculum design. As a curriculum designer, you’ve created materials with the same sorts of supports offered in CMP. But you still might be advocating for a certain kind of teaching, one that leaves these early supports off a task. Another thing you might be saying is that your curricular materials are modeling for teachers how to ask questions to their classes. In other words, you might be saying that teachers will learn how to teach better from using your improved curricular materials, with their decompressed questioning. Would you say that? I saw it as setting up the question nicely: what happens with future cubes? Something like your Penny Circle includes the same sorts of scaffolding that you highlight here: a central question, a strategy, a table, a graph, table headings. I like the way you decompress these in time, but that’s different than giving kids a chance to add these elements, which is what you seem to be advocating for here. In other words, you might be saying that teachers will learn how to teach better from using your improved curricular materials, with their decompressed questioning. Would you say that? I don’t have any evidence to support that claim. FWIW, it’s unlikely I’d use Penny Circle in exactly the way it’s devised on Desmos. Those scaffolds are aimed at some kind of imaginary modal teacher. Thanks for that, it’s really helpful. I think I see now where I’m having trouble. Would you also say that Desmos does A-M? I’m not thinking of thirteen particular actions, FWIW. But modeling at its most interesting and useful involves formulation of a problem and not just the computation of an answer. And I think the Desmos treatment of Penny Circle involves students in that process more than the print version. I’m really finding this all interesting, so I went back to Penny Circle to take a close look at the scaffolding questions you included vs. the CMP questions. In this post it sounds like you’d prefer if CMP left out the central question, the strategy, the tables and the table column headings. You give this support in Desmos, but you also ask some questions that CMP doesn’t ask: a sequence of estimation questions, a request to revisit the model. Of course, all of your questions are also spaced out in time. I’m left wondering whether Penny Circle is less helpful compared to CMP, or whether it’s just offering a different sort of help in the form of scaffolding estimation and revision of the model. But you’re saying that Penny Circle helps involve students formulate the problem? Of course what you said above still applies, and a great teacher isn’t going to need the scaffolds offered by Penny Circle or CMP and can give room for problem formulation. And Penny Circle is a great problem that would really benefit from that breathing room. It’s useful to have this same lens thrown back on our own work. Some of A-M are easier and harder depending on the medium. The conversational medium makes a lot of those questions much easier to ask than the digital or print media. Perfect. I understand this much better now. I guess my last question, for now, is what exactly are the limitations of text? I do love these prediction questions, but couldn’t CMP slip that in as question 1? And deciding which model to use in Penny Circle sounds similar to Q3 in CMP above. I don’t see any reason, in principle, that texts couldn’t do A-M. There is a part of A-M I’m struggling to define that’s almost impossible to do with paper. That includes interactions where you ask for a guess and a rationale for that guess from every student, after which the textbook finds a student’s guess that’s far from yours and displays that student’s rationale to you and your rationale to her and we all win. I can’t say it’s impossible on paper but the limit is approaching impossible. There are questions that are possible on paper like “What’s your guess?” but what the computer does with the responses is also very hard to do on paper. The aggregation, analysis, and display of the guesses, for instance. Aside from all those digital enhancements, the only other trouble is that paper is costly and weighty which means we have to pack every square inch as full of math problem as we can. A-Z all on the same page, if possible. The trouble there is that part M might undercut the force of part F. I ask you “Is the model linear, quadratic, or exponential?” and then later ask “What would the data look like if the model was quadratic instead?” Or I ask you “What’s your question about this thing?” and then tell you your question right afterwards. Impossible to fix? No, but you’d have to, like, put each part of the problem in a different visual space which is totally weird and we might as well just jump online at that point IMO. Stop citing good books and articles–I already have enough to read, sheesh! You could subtract if you had an e-book that let you. Make it easy to change how much detail the student sees. Want them to make their own table? Sure, just click the button that hides it from them. Don’t like the follow-up questions? Kill them with a click and add your own. A book question asking for a guess feels a little odd. It is like I am talking to myself when I right my guess down. If the computer asks, I feel like the computer actually wants to know what my guess is, and perhaps will do something with my guess as in the penny circle. I agree with James that Nicole’s setup comes very close to answering the question. And I agree with Dan that it prompts the question of what happens with bigger cubes. It does both at the same time. That is why it is such a nice model. Maybe some people disagree on what constitutes a “model”. 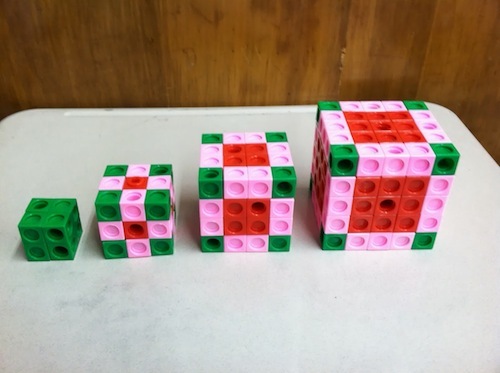 To me, one of Nicole’s cubes is already a model – a better and more flexible one than the equations and graphs requested in the original problem. I agree with Brian that the rich thinking has been sacrificed in order to steer students towards covering standards – in this case a narrow view of “modeling” (graphs & equations). The penny circle does this as well. The student’s participation in building the model is limited to entering data and picking between options lest they wonder off script in search of a more natural approach. Just wanted to direct your attention to CPM.org. the lessons often have a nice option for helping with this dilemma. They have an interesting question then have a section on the following pages called Further Guidance. I love a good set up and the TE and training are excellent for showing how to intervene and not. Pingback: dy/dan » Blog Archive » Developing The Question: Good work!